SKK Mobile is running a promo right now, called ANDROID FRENZY. Enjoy big discounts and freebies for selected SKK Mobile smartphones and tablets, below are the list of smartphones and tablets with their corresponding discounts. 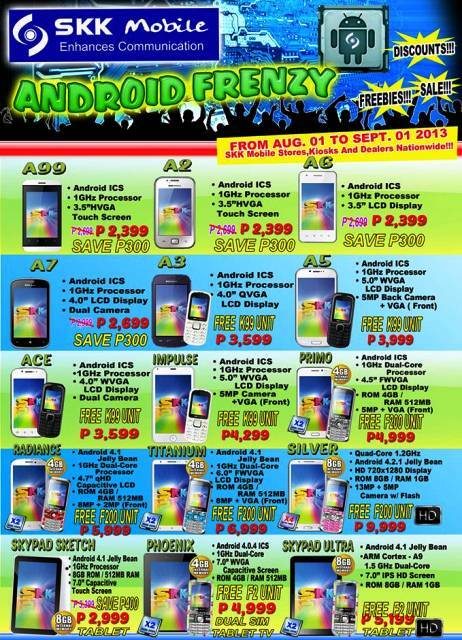 Available starting August 1 to September 1, 2013 at SKK Mobile Stores, Kiosk, and dealers nationwide. Kindly check the above photo for the rest of specs and price of the remaining smartphones and tablets. Thanks! wag kayo bumile ng SKK. magsisise lang kayo. cguro pag android..ndi naman madaling masira pag china? Based on experience po, sa gumagamit po yan. But we can't deny the durability of well known brands. bumili aq ng skk impulse ambaba ng internal storage! Sana cherry mobile na lang binili q.
ung battery hunyango..kunwari full chanrge pero pag inoof mo lowbatt agad! Maganda Ba Ang SKK MOBILE A5 ? . Balak Ko Kasing Bumili Eh . At Anu Pang Ibang Local Brand Phones Na Mura Ang Magandang bilhin at maganda Ang Specs ?! Reply Pls . I don't want to buy that skk nkka distract sang mga feedback s cellphone oh no!